Aplly a base coat to protect your nails and let it dries. If you wear tips this step is not necessary. 2. Put rubbing alcohol into a small dish.Then dip a small piece of newspaper or a magazine into the rubbing alcohol for few seconds. 5-6-7.Then put some brown and black nail polish with a piece of make up sponge or any kind of sponge you have, to create a gradient burned effect on your nails. 8. Withan acetone and a swab clean up the areas you want to start the burned effect. 9.After you finished this cleaning step of your burned nail creation, with a nail brush or toothpick and a black polishdrwa some black lines on the burnededges. 10. When you finish all these steps, clean up anny edges from your fingers.To make this look perfecte use a top coat and your done!!!! P.S. 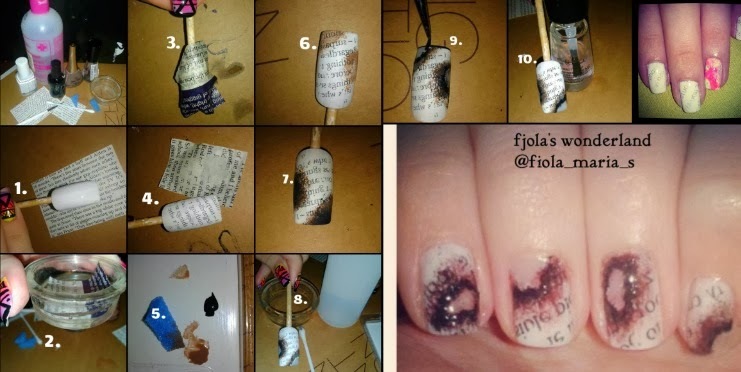 In case you don't like the burned effect, but you would like to create a newspaper nail desing. You can skip the steps 5 to 9.And you can just take a cotton swab to clean any edges of your fingers and aplly a top coat!!! !